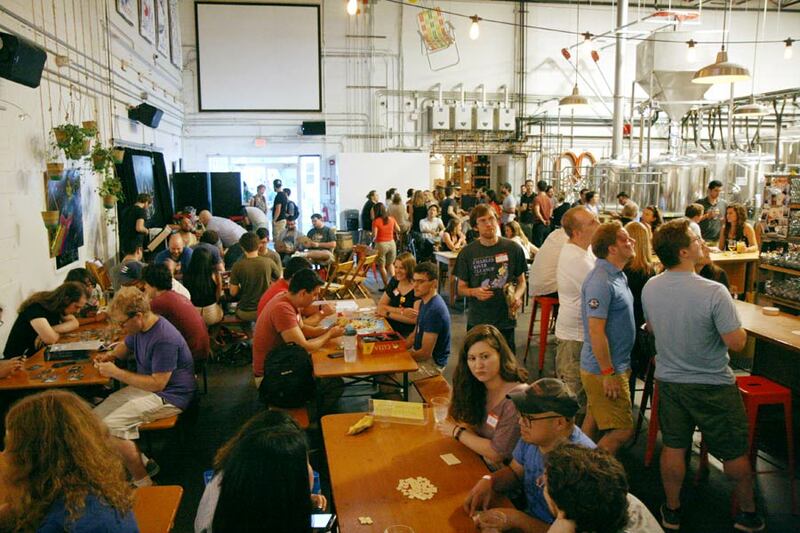 Aeronaut Brewing is in Somerville, Massachusetts, within shouting distance of Cambridge and, thus, Harvard University and MIT, as well as Boston and its bevy of tech startups. They make amazing-sounding craft beers with names like Passionfruit Sour Planet or A Year With Dr. Nandu. And every Monday, the tables in the taproom are crowded with people there to down that beer while they play…board games. Often, 50 to 100 people will show up just for the games, which occasionally causes a line out the door. 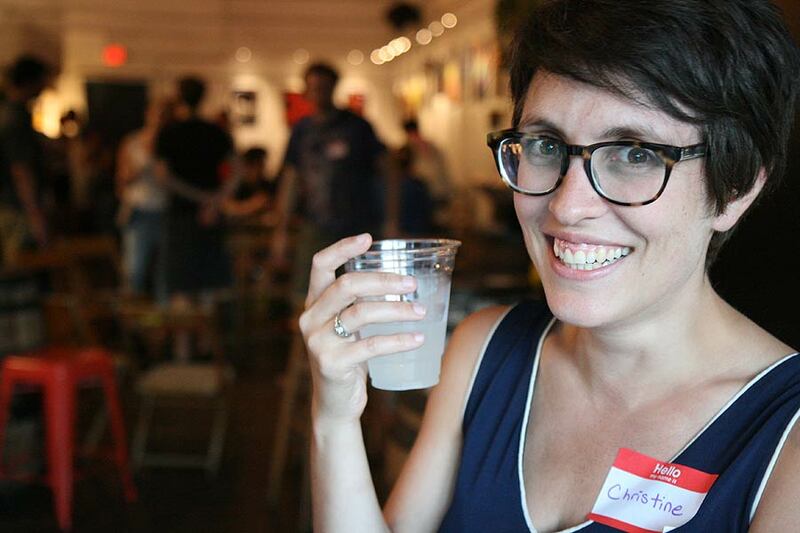 “I think I’m surprised by how successful it is,” said Christine Platzek, a social worker by day who first organized the game night 18 months ago. And habits, as the case may be. In the midst of a digital native generation, board gaming has been booming, especially the past few years. 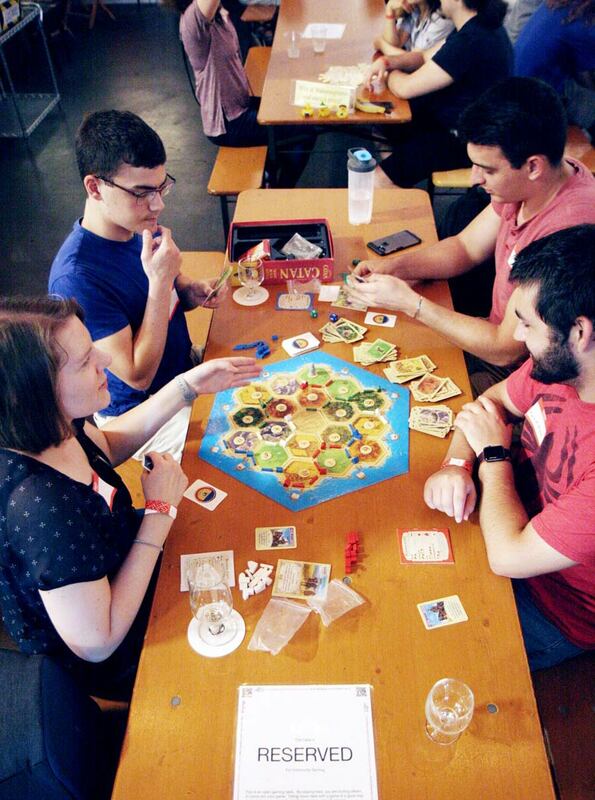 Global board game sales in 2016 neared $10 billion as a new generation of titles descended from Europe’s game design renaissance of the 1990s—Catan, Carcassonne, and their ilk—have brought it out of the kids’ playroom and into bars, networking events, and dedicated board game cafes. It may also represent a pushback to the impersonal aspects of digital interaction. Journalist and author David Sax explored that dichotomy in his 2016 book The Revenge of Analog, an entire chapter of which was dedicated to board games. Sax recently spoke with The Technoskeptic’s Art Keller [see “Q&A With David Sax”] and explained some of what he discovered during his research. Not everyone who studies board gaming sees it as a foil to digital culture. Aaron Trammell, co-editor-in-chief of the Analog Game Studies Journal, believes they are more birds of a feather. 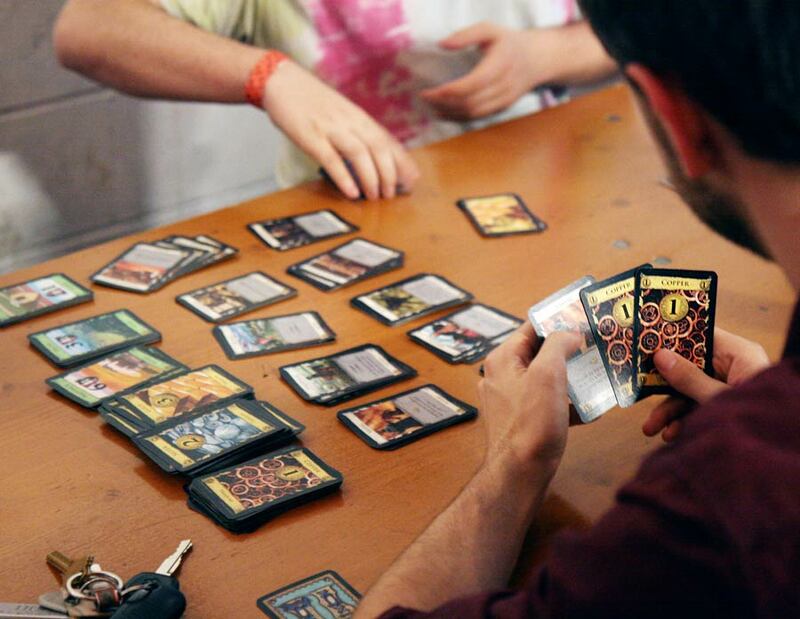 In fact, said Trammell (favorite board game: Galaxy Trucker), even though it’s common to see board games with smartphone apps that are integral to play, he believes it’s now video games that more often borrow elements from board games: Narrative journeys, mechanisms of play, even digitized versions of components like cards, dice, and tiles. Precisely quantifying the growth of what has come to be known as “hobby” board games—as opposed to mass-market games like Monopoly and Clue—is difficult, though a 2017 analysis from Business Insider predicted a compound annual growth rate of nine percent through 2022. Still, there are some statistics that allow a glimpse at the overarching trends. There are hints from how deeply the analog world of board gaming is entrenched online—from YouTube channels with six-figure subscriber counts, to the king of all board game media, BoardGameGeek.com, with five million unique visitors a month. Sales trends are trickier to ascertain, though, as most game publishers are privately held and don’t release sales figures. One that does is Singapore-based CMON, which started publishing board games in 2011 and went public on the Hong Kong Stock Exchange in 2016. In its 2017 annual report, CMON announced revenue of almost $30 million, an increase of 41.9 percent over 2016. But the the 900-pound gorilla of hobby board game publishing is France-based Asmodée, publisher of many of the biggest titles in the hobby. The company was recently purchased by a private equity firm for more than $1 billion. Another yardstick is the increase in the number of, and attendance at, board gaming conventions. Gen Con, a convention in Indianapolis with a significant board game element, saw 60,000 individual visitors in 2017. Europe’s biggest convention, the annual Spiel Fair in Essen, doesn’t report the number of unique visitors but is acknowledged to be the second-largest such event, after Gen Con. At last year’s event, publishers released or announced 1,000 new board games. The UK Game Expo, a relative newcomer at ten years old (Spiel started in 1983, Gen Con in 1968), saw more than 16,000 attendees. PAX, one of the biggest general gaming conventions with multiple dates and locations, saw its tabletop sector grow so large that it spun it off into its own convention last year—PAX Unplugged in Philadelphia. Hosting organization Penny Arcade didn’t release attendance figures, but various board game news sites and bloggers floated estimates in the 20,000 range. Even the smaller conventions are bursting at the seams; you can find a “con” in virtually every state and in almost any month of the year. BoardGameGeek.com hosts two conventions in Texas that draw around 3,000 people each for the better part of a week, plus a board game cruise. The Dice Tower Network also hosts its own annual convention and cruise. They typically sell out months in advance. Geoff Engelstein is a board game designer, contributor to Dice Tower Network podcasts, and adjunct professor of board game design at the New York University Game Center. He believes modern board games are offering digital natives more than just a break from their screens. They’re offering a framework for human interaction. And that, he said, is critical to people who may be more socially awkward or uncomfortable meeting new people—a demographic long associated with nerdy hobbies like gaming. That resonates with research done by Benjamin Woo, an assistant professor of communications at Carleton University in Ottawa, Ontario, and author of Getting A Life: The Social Worlds of Geek Culture. He believes the face-to-face nature of board gaming is a completely different dynamic from taking part in a massively multiplayer online game. Woo (who doesn’t have much time to game these days but confesses to being “a big Pandemic fan”) finds the relationship between analog and digital in geek culture very interesting. Being an outsider in society has long been a hallmark of geek culture. So perhaps the clearest indication that hobby board games have become mainstream is the fact that in many cities you can play them in dedicated cafes. As part of his research for The Revenge of Analog, Sax (who says the card game Kigi is an “absolute, meditative, and super-chill fave” of his) spent considerable time at Snakes & Lattes, a Toronto board game cafe that has since grown to three locations. He said such cafes are becoming a “third space” for gamers, a term often attributed to sociologist Ray Oldenburg to describe a place (after home and work) where people regularly gather and interact. “These board game cafes, like Snakes & Lattes, have really become the kind of hubs of social interactions, of friendships, of community,” said Sax—and that makes them an antidote to the “epidemic of loneliness” that is proliferating in many parts of the developed world.